Taking good care of your teeth is a lifelong practice. Most people have no trouble committing to brushing their teeth after meals or at least twice a day, but flossing isn’t always a part of everyone’s dental hygiene routine. However, flossing regularly has significant benefits for you and your teeth. The places where your teeth and gums meet are where flossing does the best work. While you’re eating, small particles of food can get lodged in your gums and the plaque in those areas can harden and grow over time to form tartar. This can be very damaging to your teeth and very hard to remove without a visit to the dentist. One of these benefits of flossing is keeping your gums healthy throughout your lifetime so that you don’t lose any teeth or experience pain later in life. Tooth and gum disease can turn into big problems. If the mouth is hosting bacteria, it can extend to the rest of the body and cause problems leading to heart disease, diabetes and respiratory issues. Periodontal disease (disease of the gums, teeth and mouth) can be a significant factor in heart disease and diabetes, so controlling these issues is a good step in maintaining your overall health. Going to the dentist more often than for regular checkups is an unnecessary cost. If you don’t take proper care of your teeth, you might find that you have to make more regular dental visits and even have to spend money on otherwise unneeded dental procedures. Flossing regularly can help ensure that you keep your teeth and gums in good shape so you are less likely to require serious dental work. Brushing alone doesn’t always reach into the crevices between your teeth. Floss is specifically designed to remove plaque from the tight spaces between your teeth and under your gums. Once you have removed the plaque between your teeth, the fluoride in your toothpaste can get to those areas as well and keep your teeth healthier. Another of the many benefits of flossing is how it cuts down on tartar. When you have regular dental visits, your hygienist thoroughly scrapes your teeth in order to remove tartar. This buildup of hardened plaque around your gum line can only be removed with professional help. Flossing helps to reduce the amount of tartar buildup on your teeth and manage it before it becomes a real problem. Flossing is a crucial part of your dental hygiene routine. Flossing with regular brushing can ensure that you keep your teeth and gums in great shape so that you don’t have to worry about gum disease and serious dental problems down the road. 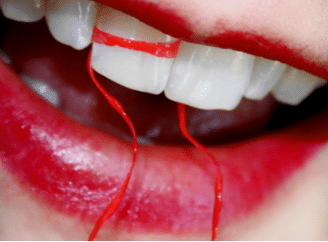 Learn more about proper flossing technique and see how well you are doing during your regularly scheduled hygiene appointments at Montrose Family Dental.